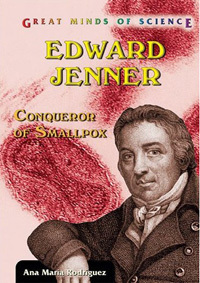 Edward Jenner Conqueror of Smallpox is one of the best books of 2006! This slim volume about Edward Jenner, one in a series of books on Great Minds in Science from Enslow Publishers, is targeted at readers in middle and high schools. If all are of this quality, then the series would be a valuable addition to school libraries. The author, Ana Maria Rodriguez, has crafted the prose in a highly accessible manner so that it can be enjoyed by students and adults who have minimal or no scientific background. She paints Jenner as a modest and likeable character who eschewed the scientific limelight in London in the late 18th century, preferring to work from his clinic in the small town of Berkeley in England's west country, where he treated patients and occasionally practiced science when time allowed. Jenner had many scientific interests, and the work that gained him entrance into the prestigious Royal Society of London described how cuckoo birds casually discard the existing occupants when taking up nesting sites. Jenner was much ridiculed by his peers for pursuing the well-established observation that milkmaids appeared relatively immune to the dreaded smallpox. He demonstrated that this was due to their prior exposure to certain types of cowpox, and his careful work laid the foundation for modern vaccination programs that were widely adopted 150 years later. Jenner was the first person to show that something could be done to halt the spread of life-threatening infectious diseases. Some of his experiments to demonstrate the efficacy of his vaccine involved infecting healthy individuals, including his own son, with the smallpox-an alarming practice by today's rigorous ethical standards, though perhaps excusable when we consider that there were no alternative approaches available in 1789. Well illustrated, clearly written, and factually accurate, the book should be well received by students in grade 6 and higher. By describing great scientific discoverers in a lively, colorful, and creative manner, the books in this series will engage students and perhaps attract some young readers to pursue the sciences. I recommend the volume highly. "These well-documented biographies recount significant life experiences . . . with appropriate emphasis on scientific work." ". . . a fascinating biography . . . a compelling but challenging read." ". . . a readable and interesting biography of this very important scientist." ". . . a very well done biography . . . quite a lot of background information on the disease, to make the importance of Jenner's discovery quite apparent." "Author Rodriguez is a scientist who works in immunology and biology, and her knowledge allows her to explain some of Jenner's discoveries in easy-to-understand terms." "A good book on scientific discovery." ". . . a very readable biography . . . Recommended for all middle school and public libraries." "Font is large and the vocabulary is easy . . . A nice introduction to the idea behind the topic . . ."
"Good for book reports and research . . ."
"The books are engaging introductions to the lives of scientists." "Rodriguez’s excellent biography reveals the whole man . . . Rodriguez gives a well-written and sympathetic account of Jenner’s experiments with smallpox vaccine . . . This book would be an excellent addition to any elementary school student’s or young adult’s library." "Well illustrated, clearly written, and factually accurate, the book should be well received . . . By describing great scientific discoverers in a lively, colorful, and creative manner, the books in this series will engage students and perhaps attract some young readers to pursue the sciences." "The language is simple . . ."